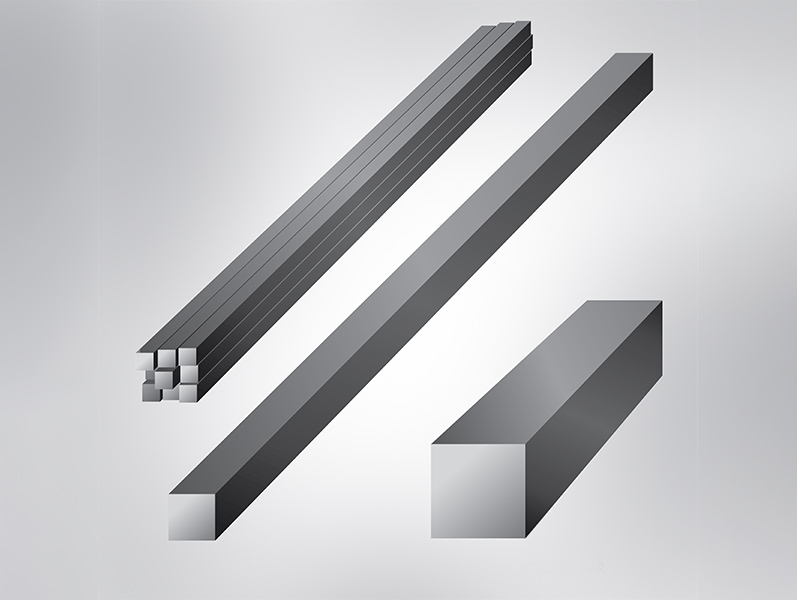 Our supply of stainless steel square bars come in both the cold drawn and hot rolled condition. Most of our square bar products 3″ and under is cold drawn, although it can be hot rolled. Cold drawn bar is shinier in appearance and has a tolerance that is similar to the hot rolled material, which is usually slightly over-sized. Most of our square bar is supplied in 12’ random lengths but can be cut to size for orders. Available Steel Grades: 304L, 316L, 303, 17-4, 416 and more! S-1/8″ Stainless Steel Square Bar	 1/8"
S-5/32″ Stainless Steel Square Bar	 5/32"
S-3/16″ Stainless Steel Square Bar	 3/16"
S-1/4″ Stainless Steel Square Bar	 1/4"
S-5/16″ Stainless Steel Square Bar	 5/16"
S-3/8″ Stainless Steel Square Bar	 3/8"
S-7/16″ Stainless Steel Square Bar	 7/16"
S-1/2″ Stainless Steel Square Bar	 1/2"
S-9/16″ Stainless Steel Square Bar	 9/16"
S-5/8″ Stainless Steel Square Bar	 5/8"
S-11/16″ Stainless Steel Square Bar	 11/16"
S-3/4″ Stainless Steel Square Bar	 3/4"
S-13/16″ Stainless Steel Square Bar	 13/16"
S-7/8″ Stainless Steel Square Bar	 7/8"
S-15/16″ Stainless Steel Square Bar	 15/16"
S-1″ Stainless Steel Square Bar	 1"
S-1-1/16″ Stainless Steel Square Bar	 1-1/16"
S-1-1/8″ Stainless Steel Square Bar	 1-1/8"
S-1-3/16″ Stainless Steel Square Bar	 1-3/16"
S-1-1/4″ Stainless Steel Square Bar	 1-1/4"
S-1-5/16″ Stainless Steel Square Bar	 1-5/16"
S-1-3/8″ Stainless Steel Square Bar	 1-3/8"
S-1-7/16″ Stainless Steel Square Bar	 1-7/16"
S-1-1/2″ Stainless Steel Square Bar	 1-1/2"
S-1-9/16″ Stainless Steel Square Bar	 1-9/16"
S-1-5/8″ Stainless Steel Square Bar	 1-5/8"
S-1-3/4″ Stainless Steel Square Bar	 1-3/4"
S-1-13/16″ Stainless Steel Square Bar	 1-13/16"
S-1-7/8″ Stainless Steel Square Bar	 1-7/8"
S-1-15/16″ Stainless Steel Square Bar	 1-15/16"
S-2″ Stainless Steel Square Bar	 2"
S-2-1/4″ Stainless Steel Square Bar	 2-1/4"
S-2-1/2″ Stainless Steel Square Bar	 2-1/2"
S-2-5/8″ Stainless Steel Square Bar	 2-5/8"
S-2-3/4″ Stainless Steel Square Bar	 2-3/4"
S-3″ Stainless Steel Square Bar	 3"